I guess I neglected this little blog for a bit. My excuse would be that I was waiting for something interesting to happen, but since my last post I’ve been to a conference, started up some brand new experiments, joined the gym and eaten at Nando’s twice, so it’s not really true. In reality, I just kept forgetting. But I thought up of a new way “thing” that will make me want to keep updating this, and fulfill my desire to draw and paint more. My blog will now be the illustrated version of my PhD life! Since setting off on my career in science, I’ve been unable to keep up my other big passion: art. This is quite a shame, as I find drawing to be not only fun, but pretty therapeutic too. It’s my way of letting off steam. So, without further ado, here is my first entry of my revamped blog (can a blog be revamped after only 2 posts?). Firstly, let’s talk about my experiments. Before Christmas, I was growing some phytoplankton that belong to a group called the coccolithophores. These guys make little armour plates out of calcium carbonate, and cover themselves in it. They look pretty spectacular, and I was lucky enough to have been able to send some samples off to Plymouth to have photos of them taken on an electron microscope. I didn’t even attempt to try and draw them because they’re so ridiculously complex. The species I was looking at is a pretty common organism in most parts of the ocean called Emiliania huxleyi, or just Ehux for short. Ehux has been the subject of a lot of studies into ocean acidification for a number of reasons. One is that they form these enormous blooms when the conditions are right, many of which can be picked up on satellite imagery. This makes them ecologically significant, as a lot of organisms higher up the food chain rely on these blooms. With that in mind, the other reason they’ve been experimented on a lot is because the process of calcification (making their shells) is potentially going to be pretty sensitive to ocean acidification. Ocean acidification causes all sorts of changes in seawater chemistry, the main result being a decrease in carbonate ions. Those carbonate ions are needed for calcium carbonate formation, and so little Ehux might not like ocean acidification. I’m now working with some different phytoplankton, belonging to a group called the diatoms. Diatoms are very cool little organisms because instead of calcium carbonate shells, they have shells made of glass (called a frustule). They look pretty spectacular because they’re so geometric in shape. For example, check these guys out. The one on the left is Phaeodactylum tricornutum. 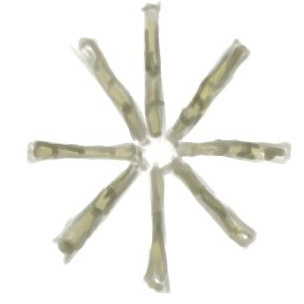 The name speaks for itself, a three-pointed diatom. Those green sausages are its chlorophylls, the same kind of pigments that give plants their green colours. In diatoms, though, they’re more brownish. The one on the right is a colonial type of diatom, from a genus called Asterionella. Each stick thing is one cell, and they always form colonies with 8 cells in the arrangement above. They’re also much more perfectly aligned than I’ve drawn here. 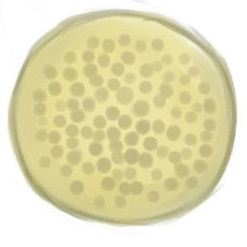 And this is the genus of diatom I’m now working with, called Thalassiosira. They’re actually in the shape of cylinders, this is what is known as “valve” view. If you see them in “girdle” view (basically from the side), they just look like rectangles. I’m going to work with a few different species to see how they respond to ocean acidification. In a lot of areas of the world, diatoms form a huge proportion of the phytoplankton community, so it’s pretty important to know how these guys will change in the future. Well, I think that’s enough about phytoplankton for today. In other news, I joined the RSPB. I’m quite keen to volunteer for them, and having membership means you get free access to their reserves. I used to be really big on birds, and I still am if I’m honest. I was a member the birdwatching group in Suffolk for a while, and when I was a kid I had a phase of wanting to be an ornithologist, despite most of my teachers not even being able to say it. The RSPB also look after more than just birds these days, so I feel it’s a good thing for me to join anyway. I used to really love drawing birds, so I decided that my last illustration for the day would be a bird. As I live near an estuary, I am lucky enough to be able to observe all kinds of shorebirds just on my bike ride to campus every day. 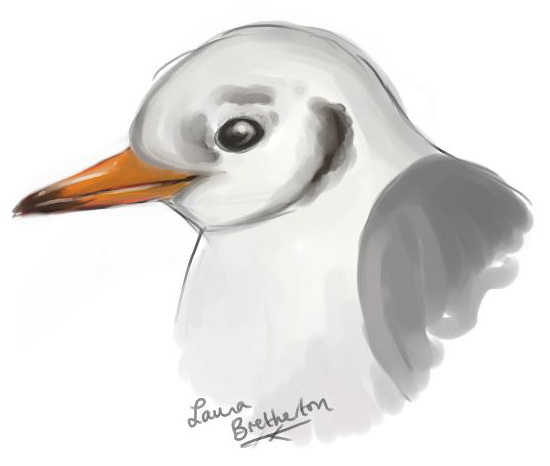 I was going to draw something interesting like a sandpiper or such, but instead I went for a black-headed gull. Okay, it’s partly because I’m a bit tired and a gull is the easiest thing to draw. But out of all the gulls, I think the black-headed is one of the prettier ones! At this time of the year, they’re not black-headed at all, just a few splodges on the face, but in the summer their whole face turns dark brown. They are much smaller than the herring gull (the typical “seagull”), and smaller still than the very sinister, and very huge, black-backed gull. There are a lot of these on the estuary, and they are very noisy. They can be little bullies too, I’ve seen them chasing some of the dunlins on the mudflats. I think that’s enough for my first illustrated blog entry. I’m kind of tired now, so I don’t think I’ll make much more sense beyond this. I’m hoping I can get to paint some of the Colne estuary and post it here. I’ll be back next week with more drawings. I promise I’ll come back this time! This entry was posted in Art, Ocean Acidification and tagged art, diatoms, marine biology, ocean acidification, plankton. Bookmark the permalink.